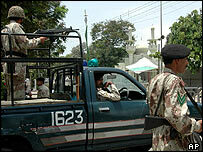 Pakistani security forces have penetrated an al-Qaeda cell in the country, the government says. Information Minister Sheikh Rashid Ahmed said the breakthrough had led to seven or eight more suspects being detained in the last two days. Another official said an al-Qaeda suspect with a multi-million dollar bounty on his head had been arrested. Last month Pakistan caught key suspect Ahmed Khalfan Ghailani, and a man said to be an al-Qaeda computer expert. Interior minister Faisal Saleh Hayyat said: "In addition to ... Ghailani, whose bounty was $25m, we have captured another most wanted suspect with a bounty on him running into the millions of dollars." He said that two other al-Qaeda suspects caught in the last 24 hours were of African origin, but did not name them. Security was tightened around financial institutions in the US earlier this week after raids in Pakistan recovered documents reportedly naming them as targets for attack. But on Tuesday, the US authorities admitted that the latest terror alert had been based on information gathered by al-Qaeda up to four years ago. The raids in Pakistan reportedly turned up hundreds of photos, sketches and written documents, which included details on the number of pedestrians passing named buildings, and whether explosives would be able to melt the steel holding them up. A computer and communications expert reportedly linked to al-Qaeda, Mohammad Naeem Noor Khan, was another of those held by the security forces. 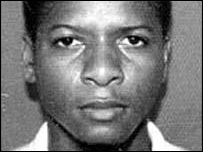 Mr Ghailani is wanted for the 1998 twin US embassy bombings in East Africa. Proposals for attacks were said to have been found in e-mails on his computer after he was captured following a gun battle in the town of Gujrat on 25 July. Sheikh Rashid Ahmed stressed that although details had been shared with the US, at no time had he or other Pakistani officials said the information collected contained plans for future attacks on the US or UK. Mr Ahmed said all the latest arrests had been made in Punjab province. He said there was clear evidence that Pakistani forces had finally penetrated the local network of al-Qaeda. One arrest was leading to another, he said, although he refused to disclose the identities of those arrested. Two senior officials told the BBC that at least one man arrested near Lahore was an Arabic speaker, and had been detained as he was preparing to leave the country. A low-ranking police official posted at the Punjab chief minister's residence had also been arrested for suspected ties to al-Qaeda, officials said.